This Decorative Table Skirt is a See-Through Cover! The Gold Throw is Perfect for Weddings and Other Formal Receptions! 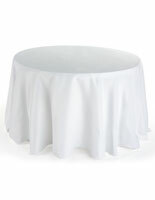 Peruse the Live Inventory Catalogue for this Table Skirt and More! 85" x 85" square sheer overlay fits various tables! Brilliant gold color is ideal for many different event settings! 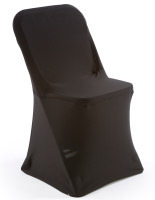 Edges are hemmed to provide a neat appearance! 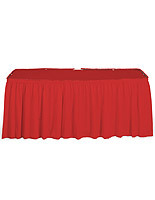 This table skirt is the perfect decoration for banquet tables! The event overlay is ideal for wedding, fundraiser, or corporate functions. If you are coordinating an event, your caterer or rental supplier will often suggest a type of table overlay to add an element of style and class, as well as a splash of color. 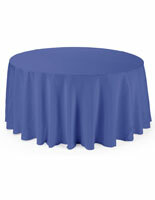 Caterers and rental companies often charge you nearly double the price of this table skirt, just to rent their overlays! Why rent when you can buy your own table skirt for less money? 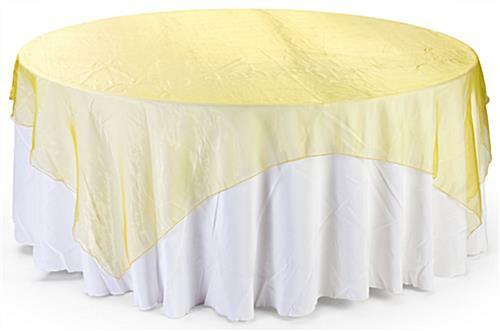 This square organza features a vibrant, shiny gold color. 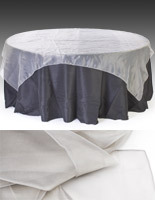 This sheer event tablecloth, table skirt measures 85" x 85", so various table sizes from round to rectangular and square will work. The sheer organza fabric overlay is crafted from a single piece of fabric to create a seamless overlay appearance. 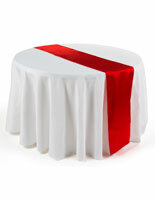 This square overlay is the ideal decoration for banquet hall tables. Pair the overlay with a fabric tablecloth or table skirt; you'll have a complete setup in minutes! 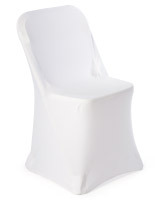 This throw could even be used as a chair bow, sash or other event decoration. 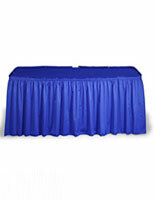 The table skirt features hemmed edges to provide a clean and professional appearance.